Mobile search company Taptu released the fourth in a series of “State of the Touch Friendly Web” reports today. The reports track mobile web trends and showcase over 100 new Mobile Touch Web sites each month. 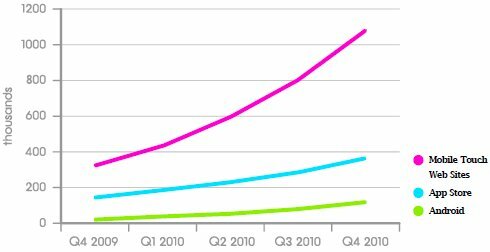 Not only is the Touch Web growing faster than iPhone apps but it is also growing twice as fast as Taptu projected in January. Taptu now expects the number of Mobile Touch Web sites to reach 1.1 million (up from their previous prediction of 0.5 million) by the end of 2010. Incidentally, the majority of the sites Taptu calls ” Touch Friendly” work just as well with the browsers on non-touch phones. Touch can definitely enhance the mobile browsing experience but it is not a requirement to use the modern mobile web. Coincident with the release of the latest report, Taptu together with mSearchgroove‘s Peggy Ann Salz have put together a Mobile Touch Web “Virtual Roundtable” in which a number of industry experts were asked to share their thoughts on various aspects of the Touch Web. I’m proud to be a part of the Virtual Roundtable which is available now on Slideshare. This entry was posted in Mobile Web Statistics and tagged taptu, touch web, web vs apps by Dennis Bournique. Bookmark the permalink.